Back in 2015, a simple inquiry regarding what color a specific dress was sparked widespread interest in how we perceive color. The fact is, the ability to perceive color is complex, and not exact. Our eyes don't see actual object(s), what you really see is the light reflected off objects. The color your eyes see is the result of what light wavelengths are reflected or absorbed by the object. However, it is unlikely that the color you see is totally correct. Physical Properties of an Object: The wavelengths of light an object reflects or absorbs naturally due to its physical makeup. Time of Day: The object is seen in morning, afternoon, or night light. Location: The object is seen in outdoor light (sunny or cloudy day) or artificial indoor light (and type of indoor light). Color Perception: Natural variations in how each pair of human eyes perceives color wavelengths. Color Blindness: Unnatural variations in how some persons see color wavelengths. The Instrument Used In Capturing the Image: The capabilities of a camera to detect color wavelengths in combination with time of day and location. The Display Device Used In Reproducing The Image: TV, Video Projector, Print reproduce images using different methods. Display or Printer Calibration: If viewing the image in print or a video display device, the standard that used to calibrate that device for color reproduction affects what you see. Although there are similarities and differences in color perception with regards to photo, print, and video applications, let's zero in on the video side of the equation. First, you have to "capture" the image. A video camera has to see the light reflecting off objects and coming through a lens. The entering light consists of all the colors reflected off the target object(s). That light enters the lens and hits a chip (in the old days, before chips, the light had to pass through a specially built vacuum tube). Once the light lands on the chip, there is a process employed by the chip, and supporting circuitry, that converts the light into either analog electrical pulses, or digital codes (1's, 0's). This converted signal is then sent to a receiving device (in this case a TV or video projector) that will convert incoming electrical pulse (analog) or digital code back into an image that is displayed or projected onto a screen.However, here is where it gets tricky. As the camera receives the light reflected off an object at a given point in time and the display device has to present the color of the captured result accurately. Since neither the capture or display device can reproduce all of the colors that are reflected from the real world objects, both devices have to "guess" based on specific "man-made" color standards, which have at its foundation, a three primary color model. In video applications, the three color model is represented by Red, Green, and Blue. Different combinations of the three primary colors in various ratios are used to recreate the grayscale and all color shades that we see in nature. Since there is no definitive correctness on how humans perceive color in the natural world, and there are limitations capturing accurate color using a camera. How is this reconciled in the home environment when watching TV or a video projector? The answer is two-fold, the type of technology used that enables a TV/video projector to display images and color, and fine-tuning their capability to display color as accurate as possible within a pre-determined color standard. Here is a brief overview of video display technologies used to display both B&W and color images. CRT - An electron beam originating in the neck of a picture tube scans rows of phosphors on a line-by-line basis in order to produce an image. As the beam hits each phosphor, the phosphor is excited and produces the image. Color is produced by red, green, and blue phosphors excited in the proper combination to produce a specific color. Plasma - Phosphors are lit by superheated charged gas (similar to a Fluorescent light). Combinations of red, green, and blue phosphors (referred to as pixels and sub-pixels) produce the designated color. OLED - OLED technology can be implemented in two ways for TVs. One option is WRGB, which combines white OLED self-emitting subpixels with Red, Green, and Blue color filters, whereas Another option is to use self-emitting Red, Green, and Blue sub-pixels with no added color filters. LCD - LCD pixels do not produce their own light. In order for an LCD TV to display an image on a TV screen, the pixels have to be "backlit". What happens in this process is that the light traveling through the pixels is rapidly dimmed or brightened, depending on the requirements of the image. If the pixels are dimmed enough, very little light gets through, making the screen appear darker. Color is added as the light travels through the LCD chip and then through red, green, and blue color filters. 3LCD - Used in video projection, works in a similar manner to LCD TV, but instead, chips scattered through an entire screen source, white light is passed through three LCD chips and a Prism and then projected onto a screen. For TV and video display application, a Quantum Dot is a man-made nanocrystal with special light-emitting properties that can be used to enhance the brightness and color performance displayed in still and video images on an LCD screen. Quantum Dots are nanoparticles with adjustable emissive properties that can absorb higher energy light of one color and emit lower light of another color (somewhat like phosphors on a Plasma TV), but, in this case, when they are hit with photons from an outside light source (in the case of an LCD TV with a Blue LED backlight), each quantum dot emits color of a specific wavelength, which is determined by its size. Placed inside of thin glass tube (referred to as an Edge Optic) inside the TV's light source structure between a blue LED edge light source and the Light Guide Plate (the structure that spreads the light across the screen area) for edge-lit LED/LCD TVs. On a "film enhancement layer" placed between a Blue LED light source and the LCD chip and color filters (for Full Array or Direct-Lit LED/LCD TVs). On a chip, where quantum dots are integrated directly on a blue LED for use in either edge or direct-lit configurations. For each option, the Blue LED light hits the Quantum Dots, which are then excited so that they emit red and green light (which is also combined with the Blue coming from the LED light source). The colored light then passes through the LCD chips, color filters, and on to the screen for image display. The added Quantum Dot emissive layer allows the LCD TV to display a more saturated and wider color gamut than LCD TVs without the added Quantum Dot layer. LCOS (also referred to as D-ILA and SXRD) LCOS is a variant of 3LCD and is used in video projection. Instead of passing light through each of the three LCD chips and then through color filters and the lens, the LCD chip is on top of a reflective base, so when a colored light source passes through the chip is automatically reflected back and sent through the lens to the projection screen. DLP (3-Chip) - Used in Video Projectors - The key to DLP is the DMD (Digital Micro-mirror Device), in which every chip is made up of tiny tiltable mirrors. This means that every pixel on a DMD chip is a reflective mirror. The video image is displayed on the DMD chip. The micromirrors on the chip (each micromirror represents one pixel) then tilt very rapidly as the image changes. This produces the grayscale foundation for the image. In a 3-Chip DLP video projector, three light sources are used (or white light passed through three prisms). The colored light is then reflective off of three DLP chips (they are all grayscale, but are each is receiving different colored light). The degree of tilt of each micromirror in relation to the color light source at any given time determines the colors in the image. The reflected light is then passed through the projector's lens to the screen. DLP (1-Chip) - Used in Video Projectors - In this arrangement, there is a single white light source that is reflected off of a single DLP DMD chip. Then, color is added as reflected light passes through a high-speed color wheel, through the lens, and then to the screen. For further technical explanations on DLP, check out our companion article: DLP Video Projector Basics. So, now that the electronics and mechanics have been worked out on how a color image gets to either your TV or video projection screen, the next step is to figure out how those devices can reproduce color as accurately as possible, despite technical limitations. This is where the application of color standards within the visible Color Space become important. NTSC - The basic standard for analog color (U.S.). Rec.601 - Improvement over basic NTSC standard. Rec.709 - For use with HDTVs and HD Video Projectors. Rec.2020 - Intended for use with 4K Ultra HD TVs and Video Projectors. sRGB - For Use Mostly in PC Monitors for displaying graphics. Using a combination of hardware (colorimeter) and software (usually via a laptop), a person can fine tune a TV or video projectors color reproduction capability to one of above standards (depending on the TV's color specifications) via adjustments provided in either the video/display settings, or service menu of the TV or video projector. Examples of basic video (color) calibration tools that you can use, without the need of a technician, include test discs, such as Digital Video Essentials, Disney WOW (World of Wonder) DVD and Blu-ray Test Discs, the Spears and Munsil HD Benchmark, the THX Calibrator Disc, and the THX Home Theater Tune-up App for compatible iOS and Android phones/tablets. An example of a basic video calibration tool that employs a Colorimeter and PC software, is the Datacolor Spyder Color Calibration System. An example of a more extensive calibration tool is Calman by SpectraCal. The reason the above tools are important, is that just as indoor and outdoor lighting conditions affect the ability of us to see color in the real-world, those same factors also come into play as to what the color will look like on your TV or video projection screen, taking into consideration how well your TV or video projector can adjust. Calibration adjustments not only include things such as brightness, contrast, color saturation, and tint control, but also other necessary adjustments, such as Color Temperature, White Balance, and Gamma. 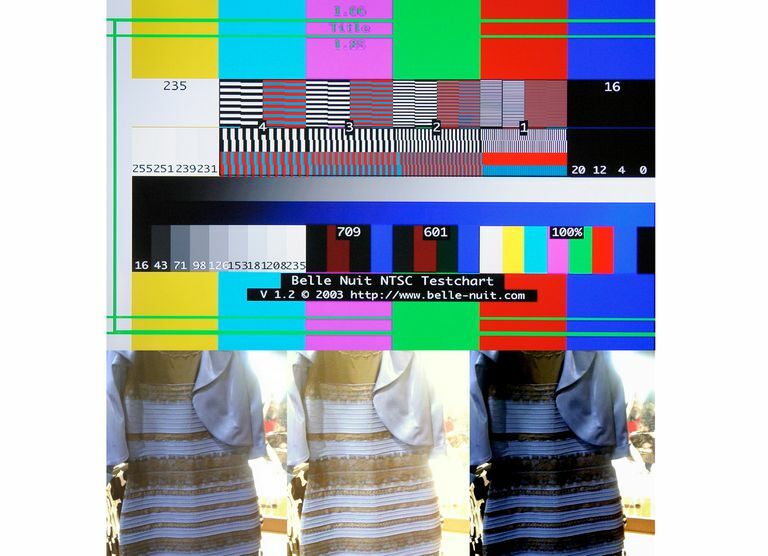 Color perception in the real world and TV viewing environments involves complicated processes, as well as other external factors. Color perception is more of a guessing game than a precise science. The human eye is the best tool we have, and although, in photography, film, and video, accurate color can be tagged to a specific color standard, the color you see in a printed photograph, TV, or video projection screen, even if they meet 100% of a specific color standards specification, still can't look exactly the same as how it might look under real-world conditions.